It's true, just as it's tough to simultaneously enjoy outhouses and Japanese toilets, chances are that you won't dually appreciate both circuit boards and pens. Still, we had to write (type, I should say) about the Circuit Board Pen. 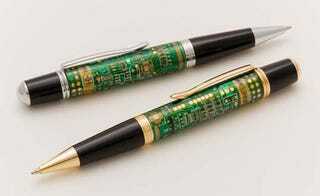 Not just some ballpoint coated in a cheap electronic veneer, the pen features a real circuit board painstakingly wrapped in an extremely thin layer of custom-lathed acrylic.